ooh, ziph did the music.. GEIL! Awesome 2nd demo :OOO Loved the plotter screen a lot!! Also _excellent_ tune and gfx guyz! Good demo. Music is excellent! Short & stylish code/Design, awesome tune, lovely picture & great logos! rulez added on the 2015-04-05 09:01:48 by w00t! Cool. Some effects are not very big (plasma) but dots where nice and smooth. You make progress fast, nice! 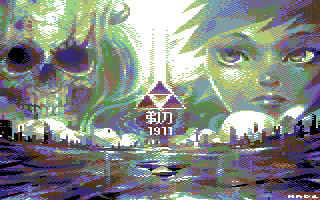 Congrats on your first "real" demo on C64 - nice style, great graphics and some good code. I enjoyed it on the bigscreen, keep it up! an ok, simple, c64 intro. did not understand what is all that hype about. Sorry i really didn't get all the hype around. Looks like all you need to win the compo and all the meteoriks awards are c64 as a platform, plasma as effect, converted picture and a bunch of friends. Really sorry if i didn't caught something important. Lovely gfx and nice SID. Very nice, both visually and soundwise! Perhaps you are right and i don't know what demoscene is and how it works. But you can always teach me what it is. Also, you can teach me and all of us, how to cheat up with the votes on scene.org awards. just for plasma, overhype and your bad manner reaction to thumbdown. Good SID (can we hear some DANE's influnces in there or I am mistaken) nice Made's pic.. It was... OKish... I guess. I'd be lying if I said this thumbs up didn't have Razor in mind. Then again, what do I know about C64 demoscene? Part of my Revision thumb up series campaign : very enjoyable fitting, did not disappoint. Decent flow, and always nice to hear a new tune from Ziphoid. The effects were underwhelming, but ok given the circumstances. good spirit. But I don't like c64 colors.. I'm sorry, this doesn't compete with the big guns for me. All the parts were fairly simple and straightforward. Good music by Ziphoid, nice looking credits part and that's it, more or less. Plasma isn't exactly great and the other parts are fairly simple. Still not bad though. Nice little prod. Keep'em coming. Great music and nice fullscreen picture, otherwise didn't find it that special. @sim: Well, I've listened a LOT to Dane's stuff, so I'm pretty sure I'm influenced by it. However, melodies and harmonies is basically what I've always done (just look back at my tracks from the mid-80s and onwards) and I completely love Dane's ways of using that, so I guess our minds just works in similar ways (although his execution is much more technically perfected :)) and therefor it can sound influenced. Oh, and thanx to Made and Kenet for their beautiful gfx and rez for his positive attitude and attention to details (and for liking my little tune :)). Razor 1911 on C64, cool. Nice little prod. We will keep a seat warm for you guys in the amiga world. really nice little demo. very clean with good graphics and good music . Thumbs up for the artistic department and overall design. Solid work, I enjoyed the show. The spirit is there, nice work! Can someone explain the photo / picture with the skull? why the japanese / chinese ? text?? Great work Rez! Really impressive for a second production on the C64 and of course amazing graphics by Rez and Kenet. Nothing breathtaking but ok for a single onefiler. Excellent! No idea why I haven't thumbed this up earlier. Where did that thumb go ? Um.... sorry to keep pestering but.... is the soundtrack released? btw, the soundtrack will be released with the final version of the demo. Nice little prod and it would be fun to see a Razor 1911's prod back on the Amiga. page created in 0.024408 seconds with 15 queries.